When you go to Eiko and Koma’s “Naked”—it is playing at the Baryshnikov Arts Center through Saturday night—what you see is two bodies lying side by side on a mound of soil and feathers. So this is a scene from nature, but it is no pastoral idyll. The bodies are white, gaunt, and utterly naked. They move little, and slowly, and mostly just in relation to each other. Koma puts his foot on Eiko’s knee; she puts her arm inside his elbow. They don’t look at each other while they’re doing this. They seem to see not with their eyes but with their pores. Koma, at one juncture, hoists his buttocks into the air. Accustomed, by this point, to the glacial slowness of the couple’s movement, we see this action as intensely dramatic, like an Act II curtain. What will happen now? we wonder. What happens is that he puts his buttocks down, in a slightly different position. Eiko and Koma have been making dance dramas like this for decades. 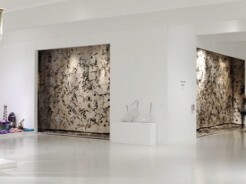 “Naked” is part of what they have called their Retrospective Project, celebrating forty years of collaboration, thirty-five of them in New York. It includes not just performances but videos, photography shows, and other art. Eiko and Koma are not so much a dance duo as an arts organization. She writes; he paints, etc. They moved to New York in 1976, a time when many American vanguardists—preëminently John Cage—were still fascinated with Asian art. For five years, they had some success. Then, in 1981, they decided that they had been influenced by too many artists, and they left town, moving to a property in the Catskills. There, for two years, they lived with eight chickens, as Koma told Shoko Yamahata Letton (from whose master’s thesis, at Florida State University, much of this biographical material is drawn), and asked themselves what they really cared about. They found an answer in nature, the things that were around them. Hence the names of the dances that they now made: “Tree,” “Land,” “Grain,” “Rust,” and so on. movement is basically same,” Eiko told Shoko Letton. “Embarrassingly same.” Like good craftsmen, they made a virtue of necessity. Many people have likened the couple’s work to Butoh—a comparison that Eiko and Koma object to adamantly. In fact, they have a lot in common with Butoh: the naked body, the primitivism, the slowness, the note of horror. These similarities may be due not to descent from Butoh, however, but to the fact that they and Butoh descend from shared sources: above all, Hiroshima and Nagasaki. (“From Trinity to Trinity,” a book written by the Nagasaki survivor Kyoto Hayashi, and translated from the Japanese by Eiko, was recently published by Station Hill.) Furthermore, Eiko and Koma’s performances differ from Butoh in a number of important ways. Their limbs don’t make a great, beefy show, in the manner of Sankai Juku, the Butoh troupe that has been seen most often in the U.S. (Eiko holds her arms in bizarre, bent-back positions. How does she get them there? Should she see an orthopedist?) More crucially, the two of them do not ordinarily play the same roles. Koma looks like us. Things happen to him. Eiko is what happens. She is our ghost, our bad dream, our coming death. Finally, there is the subtlety, the knottedness, the ambiguity of their gestures. I must say that their shows, like Noh plays, are too long and too slow for me. I start thinking: Did I feed the cat? Did I send my aunt a birthday card? That experience is not so strong with “Naked,” because this piece is open-ended. You can come and go as you please. (Each night, Eiko and Koma perform for four to six hours, with one five-minute break.) But, however much you may zoom in and out, you are rewarded, when you zoom in, by the intensity of the proceedings. As Koma lifted his rear into the air, I stared into his navel for a long time—these people give you time—and I thought that if I could look into that dark hole a little longer I might discover a great deal about life. This may be just a compensatory fantasy, a product of the audience torture so widely practiced by the avant-garde: since you’ve waited this long, there has to be a payoff. I don’t think so, though. Part of the reason my mind tends to wander in Eiko and Koma’s pieces is just the sheer, frightening concentration of what they do. When we perform, we like to imagine that each of us is a fresh fish which was just caught and is on the cutting board. The fish intuits that somebody will eat it. No room to be coquettish. The fish’s body is tight, shining blue, eyes wide open. No way to escape. Who else, in contemporary dance, performs with this kind of directness—so cold and serious?